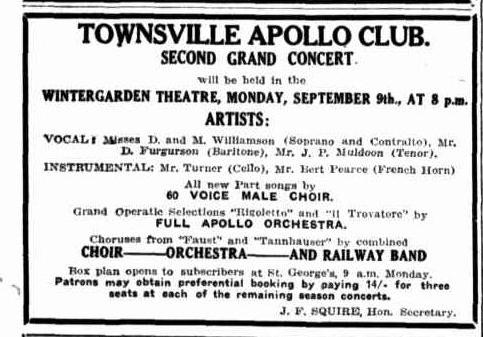 The Townsville Apollo Club was first formed in 1929 and was a male voice choir of 60 voices with a full orchestra and often assisted by the Townsville Railway Band. 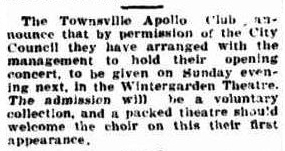 They held their first opening concert at the Wintergarden Theatre on Sunday 24th March 1929 after church hours by special permission. 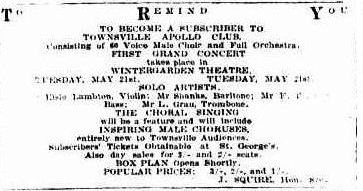 The first public concert was switched from the Wintergarden Theatre to The Strand Rotunda due to unforeseen circumstances as shown in the next advertisement. 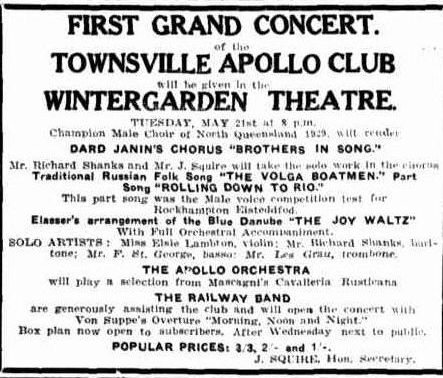 The First Grand Concert took place at the Wintergarden Theatre on Tuesday 21st May 1929 as shown below. 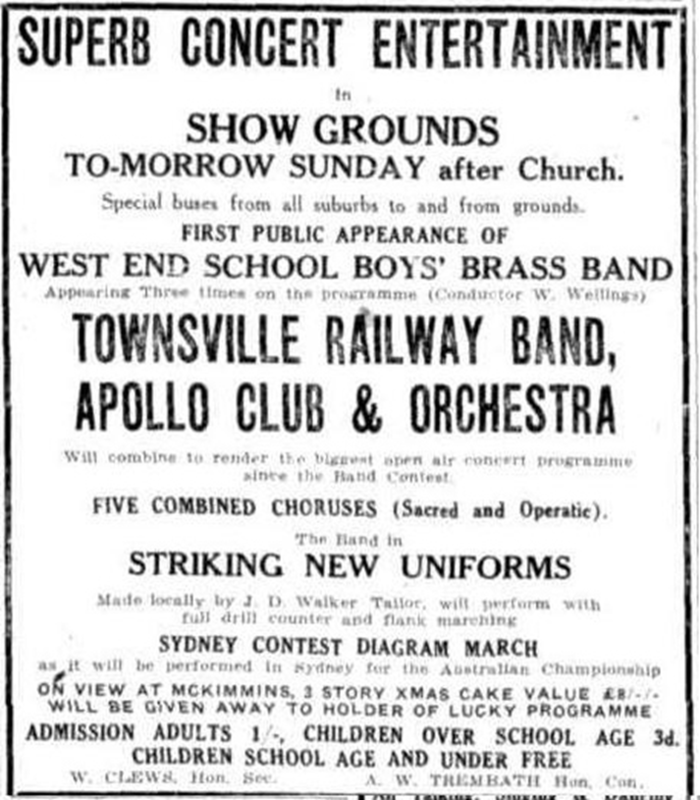 The 2nd Grand Concert was held on Monday 9th September 1929 at the Wintergarden Theatre as the advertisement below shows. 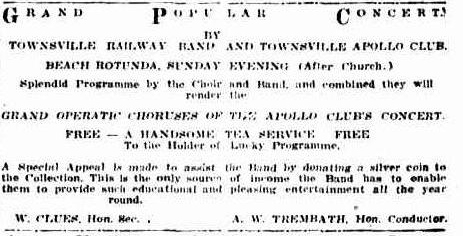 The next concert was by the Railway Band assisted by the Apollo Club on Sunday 22nd September 1929, at The Strand Rotunda, as per the advertisement below. The next concert for the year was held on Monday 9th December at the Wintergarden Theatre and again assisted by the Railway Band, as shown below. 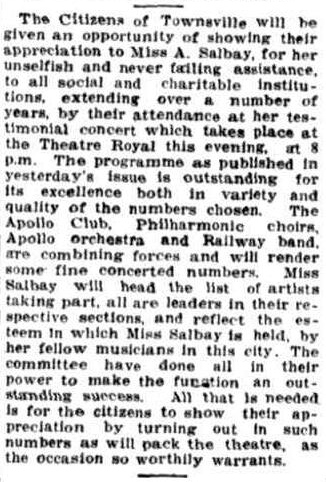 The next concert was a combined concert at the Theatre Royal, on Thursday 22nd May 1930 as a community send-off for Miss Annie Salbay. 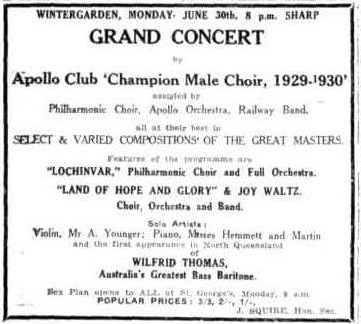 The first Apollo Club Grand Concert for 1930 was held on Monday 30th June 1930, at the Wintergarden Theatre, with Australia’s well known Bass-Baritone Wilfred Thomas as a guest. 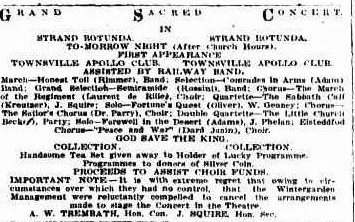 On Sunday 13th July 1930, the Apollo Club and the Railway Band combined to present a concert at The Strand Rotunda after church services. 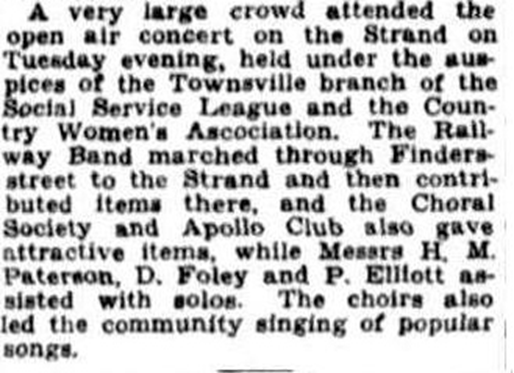 The Apollo Choir were one of the guests at the Presbyterian Church concert held at the Theatre Royal on Friday 22nd August 1930. 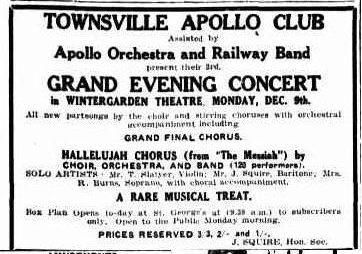 On Monday 6th October 1930, the Apollo Club and Orchestra assisted by the Railway Band gave their second concert of the second season at the Wintergarden Theatre. 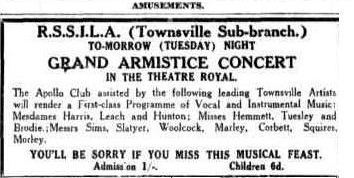 The R.S.S.I.L.A Grand Armistice Concert at the Theatre Royal on Tuesday 11th November assisted by the Apollo Choir and other guests, as per the advertisement below. The Caledonian Association organised a concert and dance on Friday 21st November at the School of Arts. the Apollo Club and local artists assisting. 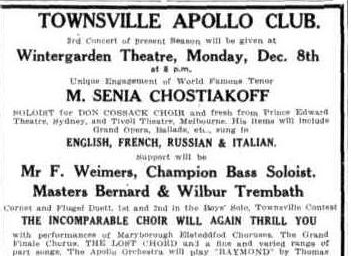 The third and final concert for the season was held on Monday 6th December 1930, at the Wintergarden Theatre,with the Russian Tenor M. Senia Chostiakoff as the visiting guest. Arrangements have been finalised with Mr Clement Q. Williams for him to appear at the Apollo Club and Orchestra’s first concert of the season, as visiting artist from Sydney. He is one of Sydney’s most popular baritones, and his singing of the modern compositions has met with instant success. 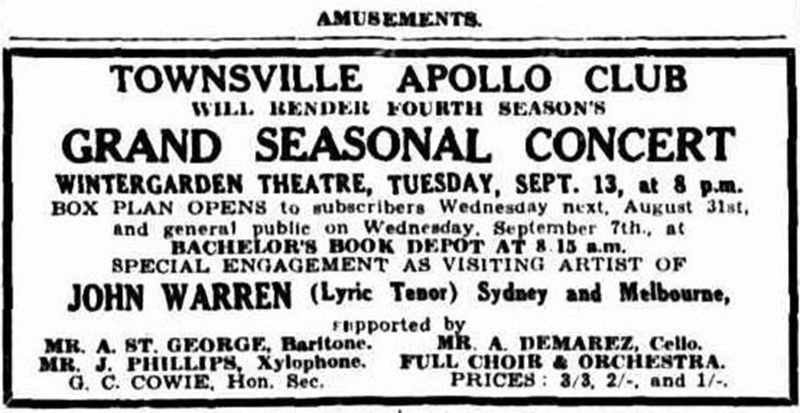 The vocalists presented by the Apollo Club, to their subscribers have been of the very highest standard. Mr Williams is also a brilliant and successful singer, and is the possessor of a baritone voice of fine tone and quality. He is a finished artist and sings with expressive sincerity and refined emotional charm. The concert will take place in the Wintergarden Theatre on Tuesday evening, the 11th of August, and the box plan opens at Batchelor’s book depot, Tuesday morning next at 8.30am to subscribers only for one week. Subscribers’ tickets may be obtained from the secretaries, G. C. Cowie and G, Franklin, or at the booking office. 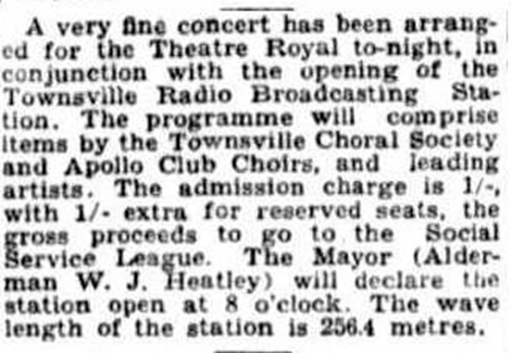 A quartette from the local Townsville Apollo Club performed at the Official Opening of the Townsville ABC radio station 4QN at the Theatre Royal. The quartette comprised of Messrs J.Squire, A.W.Trembath, G.C.Cowie, and Ray A. Lewis.